When choosing furniture for an outdoor living area, a homeowner needs to take several factors into consideration. Furniture that is meant to stay outside needs to be resistant to all types of weather conditions. Lots of outdoor furniture is made with natural wicker. However, that is not always the best choice, as it does not always stand up to the worst Mother Nature has to offer. Often, the better choice is synthetic resin wicker furniture. This type of material holds many advantages over natural wicker. Explore the many benefits of resin wicker furniture below. What is synthetic resin wicker? Synthetic resin wicker is a bit of a misnomer. It is not synthetic in the sense of being fabricated from non-organic materials. Resin is a material that is made from plant matter. The liquids that are derived from the plants are capable of hardening permanently, and it is this quality that allows the furniture to be resistant to the elements of weather. The frames of resin wicker furniture can be made from materials such as aluminum and steel. These materials are strong, sturdy, and rust-proof. They combine to make a product that is perfectly suited for remaining outside for extended periods of time without being damaged. Further, the coating on resin wicker furniture will not come unglued from the frame, ensuring that it will remain good-looking even after it is no longer new. All-weather resin wicker is moisture-resistant. Even in heavy rains, the water will simply bead and stream off of it. Conversely, natural wicker will absorb even the smallest amount of water, which can ultimately result in the furniture warping. The sun’s rays can be as damaging to outdoor furniture as it can be to human skin. Despite being outside all day and being exposed to the beating sun, the resin coating on all-weather wicker furniture is impervious to the damaging rays. Even after prolonged periods of time in the sun, resin wicker furniture continues to hold its shape and color without any variation. When natural wicker furniture is exposed to the sun, the fibers will fade and become brittle, which can lead to breakage. 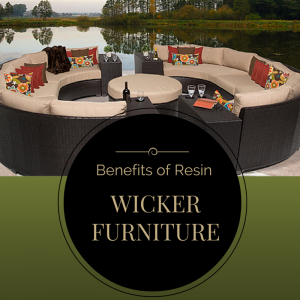 An added benefit to the fact that resin wicker furniture does not absorb moisture is that this quality makes the furniture resistant to the growth of mold and mildew. Mold and mildew require moisture as well as a lack of ventilation. Synthetic resin wicker is quite easy to maintain. The color of the resin is mixed right into the material when it is manufactured. This process results in color that will not peel or flake. Even when the furniture is exposed to excessive rain or snow, the color will remain. This quality is especially helpful for homeowners who do not wish to have old-looking outdoor furniture nor replace natural wicker furniture every few years. Resin wicker furniture requires a minimal amount of care. Since it spends its life outside, wicker furniture is prone to get dirty. It is subject to dirt, pollen, and anything else the wind can conjure up. Cleaning resin wicker furniture is as easy as simply hosing it off with an ordinary garden hose. It doesn’t even need to be dried. Just let it sit outside and allow the sun and wind to do the work. All-weather resin wicker furniture has an aesthetic appeal that can’t be beat. It has a natural tendency to blend in with its environment, so it is perfectly suited for any decor and within any type of landscape. Resin wicker is now being produced in a variety of colors, so home owner’s now have more choices beyond white and earth tones. On average, the cost of resin patio furniture is less than that of natural wicker furniture. So, it is the perfect choice for anyone who is trying to remain within budget but is still looking for a nice product. All-weather resin wicker furniture has an aesthetic appeal that can’t be beat. It has a natural tendency to blend in with its environment, so it is perfectly suited for any decor and within any landscape. Resin wicker is now being produced in a variety of colors, so homeowners now have more choices beyond white and earth tones. Resin wicker furniture is lightweight and easy to move. This is a great feature for any homeowner who likes to regularly rearrange the furniture. Pieces of resin wicker furniture can be easily moved by just one or two people. Check out our website to see Design Furnishing’s wide selection of resin wicker furniture today! All-weather resin wicker furniture is a great choice for outdoor furniture for a multitude of reasons. Not only can it stand up to all elements of the weather, it is strong and durable enough to withstand heavy use by people. On top of that, it retains its good looks for a long time and is well-priced.